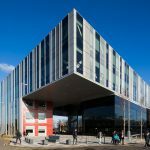 The scope of work on this project also included the refurbishment of all existing Schueco RS50 Windows and FW50 Stick Curtain Walling which were supplied and installed by Alucraft 25 years ago. As testament to the excellence of Alucraft and Schueco, post forensic investigation of the windows and curtain walling concluded only the gasket and IGUs had to be replaced. The aluminium framing was 100% retained. This is just one example highlighting the quality and workmanship of Alucraft & Schueco products. The new extensions and rooflight were designed and constructed in FW50+ & FW60+ Stick Curtain Walling with the rooflight semi capped and the façade fully SG. In addition to the glass façade were various other items such as aluminium soffit panels and parapets, louvres, revolving doors, internal fire rated atrium screens with feature fins. 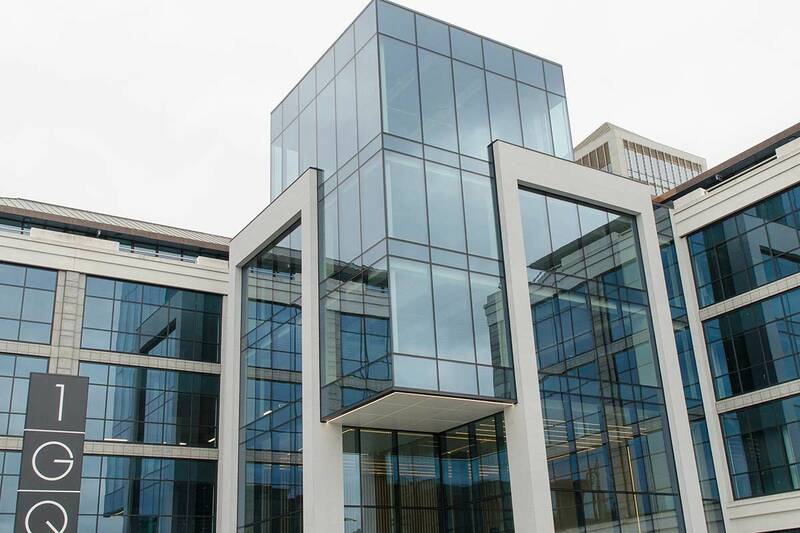 Alucraft faced two challenges on this project, the first detailed already whereby all the existing Schueco windows and curtain walling were retained, cleaned and replaced with new gaskets and IGUs. The second challenge forced us to be innovative in our design of the front extension for the feature façade corner, which hangs from the top on a very light steel frame. This was the largest and most impressive feature on this refurbishment project, creating a huge glass overhang above the double height main entrance lobby. BKD’s architectural intent was to have a seamless glass to glass corner of two full bays to make the most of the spectacular view over Dublin’s docklands. This was incredibly challenging given that the screen hung from the top and was not stacked in the usual fashion. The seamless feature meant that no corner mullions were permitted and only minimal support possible. We accomplished this by integrating a 50mm diameter rod which connected transom to transom via cleat, which was then welded directly to a transom reinforcing core. The core then was invisibly connected right through to the side mullions hidden within the transoms. This eliminated any differential movement from thermal expansion and movement of the lightweight structure.